There's a ton of stuff about Imperial Guard out there. More than any one person could keep track of. 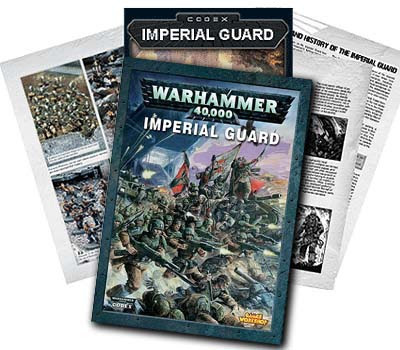 Here are a few things from FTW Blogger Group members that might help you with getting to grips with the new Imperial Guard. Wanna contribute to this post? If you're a blogger and you've got an Imperial Guard related post, send me the link by email and I'll add it here. Great resource - this will sweeten some of my long and boring office days, simply digesting everything. Sledgehammer of a post - Great work Ron. great stuff. you've created a fantastic reference list! Cant email at the moment but please add my Jerran Kell onto your painting list, its not a full tutorial as I didnt have the camera for most of the time but its well explained. also Im working on a chimera varient (I've done pt 1 and 2 but 3 wil follow). Also one for Vox's if anyone is interested? Thanks guys, this is your stuff though. You all are the ones making this what it is. The members of the FTW Blogger Group have tons of great hobby material... on all kinds of topics. This is just the tip of the iceberg. Kings Standard Bearer: Both links added, thanks! Thank you Ron, the power of FTW is awesome, since you posted those for me I have 3 more followers! I highly reccommend everyone sends their IG links to FTW! thanks Ron. found a few articles that really peaked my interest. Hrrmm... not seeing my armored sentinel tactica in here. Thanks for letting me know Max, the offending party has been sent to "remedial training."